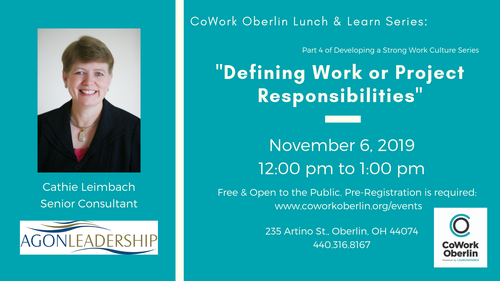 Defining Work or Project Requirements - Nov 6, 2019 - OBP : CHAMBER : Positively Oberlin! Website: Visit CoWork Oberlin's Website! Many underperformers indicate that they aren’t clear what good performance looks like. They experience this frustration in their ongoing daily work and when assigned to a special project. They are surprised when the supervisor or project leader expresses concern with their progress. This session outlines the information that people require in order to meet the leader’s expectations. The first requirement is a very specific description of the intended results. At an auto repair shop, mechanics aren’t simply told to ‘fix the car that is in their work bay’. They are provided with a work order that lists the specific work to be done or the problems the customer is having. The second requirement is clarity about the resources to be used to do the job. There is often a list of parts and a price estimate on the work order. If the mechanic needs additional parts or time to complete the job, he needs to get authorization from a manager and/or the customer so that expenses will not be incurred for if the customer is unwilling to pay for them. The third requirement is the timeline. Is the customer waiting at the shop to get the tires rotated or are they working at the office building down the street and picking the car up at the end of the day. This information influences the order in which the cars will be repaired and whether a non-urgent job that requires a part from a supplier across town can be done that day. This workshop will help you develop clear descriptions of what is expected of staff or volunteers in a regular job or a special project assignment, including the results, the resources to be used, and the timeline to be met.